Bite-ON Fish Attractants are 100% biodegradable, non-corrosive, and do not pollute lakes, streams, or other waterways. Bite-ON is infused of completely natural, non-toxic ingredients, which are water-soluble. Just dip, apply, and/or marinate onto any live or artificial bait and lures. Bite-ON sticks onto your baits longer and slowly releases a Bite-ON Scent Trail in the water. Thus attracting more fish, producing a harder strike, and a longer hold time. Bite-ON Fish Attractants are 100% biodegradable, non-corrosive, and do not pollute lakes, streams, or other waterways. Bite-ON is infused of completely natural, non-toxic ingredients, which are water-soluble. Just dip, apply, and/or marinate onto any live or artificial bait and lures. Bite-ON sticks onto your baits longer and slowly releases a Bite-ON Scent Trail in the water. Thus attracting more fish, producing a harder strike, and a longer hold time. UniButter works best when generously applied to artificial baits like CrankBaits, SwimBaits, Scampies, SpinnerBaits and Grubs. 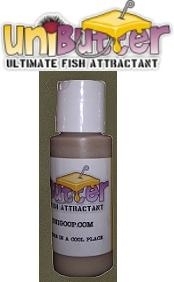 Apply the UniButter as needed, however most anglers re-apply every third or fourth cast.